These are comments I’ve actually heard from consumers and patients. What these same consumers have actually done is let me know they are very misinformed. How? Read on. MSG (short for monosodium glutamate) is nothing more than an amino acid called glutamate, attached to a molecule of sodium. Amino acids are the building blocks of all proteins, and glutamate is one of the most plentiful amino acids in our food supply. It’s also the amino acid that’s the most plentiful in your own gut. 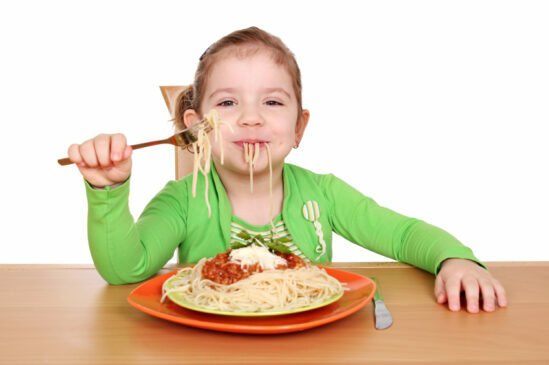 Do your kids like Italian foods like pizza, or pasta with tomato sauce and parmesan cheese? Do they like walnuts? Hey, do they eat meat? If so, they are getting a ton of glutamate. Why? Because glutamate is naturally present in these foods – and it’s always been there and your kids (and you) have always been eating glutamate, without even knowing it. Not only is that just fine, it’s actually good because glutamate has some very necessary functions in the gut. Glutamate helps the gut produce energy and combines with other amino acids to make protein. One interesting function of glutamate is its role in the production of a powerful antioxidant called glutathione. Of course, kids don’t care about any of that; they just want food that tastes good. That’s where you can really taste what glutamate can add to foods. It’s not really a particular flavor like orange or mint, but it adds an intensity of flavor to foods that contain it. That flavor intensity is called “umami” and you may have heard chefs speak of it. They all want their food to have that special something and umami is often a part of it. Foods like parmesan cheese, mushrooms, tomatoes, walnuts, and asparagus are absolutely loaded with glutamate, even though MSG is not added to them. Can kids (or anybody) get too much glutamate? I won’t say it could never happen, but I can say there’s no known case where it’s ever happened. That’s because even at high intakes, the vast majority of glutamate never even leaves the intestine. But is the MSG you buy really natural? Shouldn’t kids cut back on sodium? Yes, because glutamate is produced by natural fermentation – the same type of fermentation that produces other foods like yogurt and vinegar. The “S” in “MSG” is just sodium. And yes, most kids (and their parents) could do with a little less sodium in their diets. But, MSG can actually help with that. Gram for gram, MSG has about two-thirds LESS sodium than regular table salt. Indeed, if you swapped out the salt shaker for MSG instead, you’d really lower your sodium intake. I’m not advocating that per se, but replacing some of the salt you use in cooking with some MSG would be an easy and painless way to reduce sodium in your kids’ diets – and also kick up the flavor of those dishes while you’re at it. As a pediatric registered dietitian/nutritionist who has been counseling families for over thirty years, I would never take chances with children’s health. Indeed, I always look for a “win-win,” and MSG is a nice tool for increasing flavor while reducing sodium. I also spend a lot of my counseling time busting myths and misperceptions. To that end, I know that words matter. Think of a chef on a talk show who spoke of the deliciousness of having food with more umami flavor. Then think of that same chef bragging about adding MSG to foods. The perception would probably be different, but in reality he/she is talking about the exact same thing. Food fears about MSG? Give them a hug and let them go. Besides, now you know just why your kids love Italian food so much.